My name is Teresa Newton and I work as an EMT on an ambulance. I have been baking for friends and family most of my adult life and began doing cakes after taking a Wilton basic course in 2000. 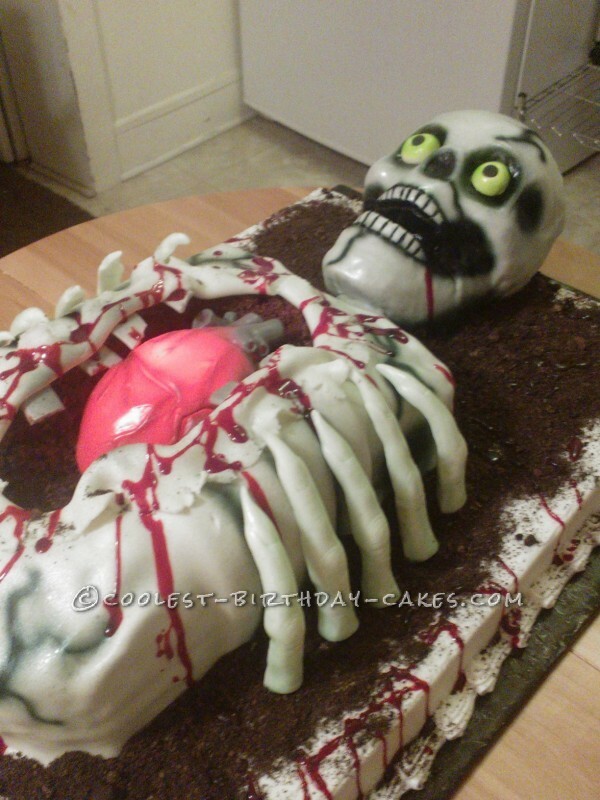 This skeleton cake was for my friend whose son turned 17 on Halloween. 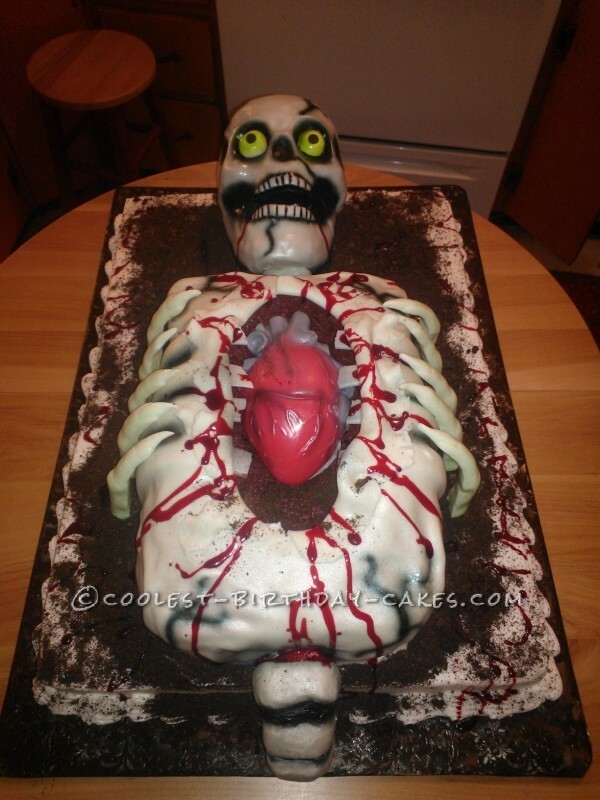 The cake itself is a half sheet on the bottom and a quarter sheet on top for the body, the head was formed from a skull cake pan, and I split open the mouth. The head and body are covered in marshmallow fondant that I made. I cut out the center of the quarter sheet cake in order to place a plastic heart inside of his chest that changed colors. The ribs and fingers are also made of fondant, with tylose powder added to it for them to set up. 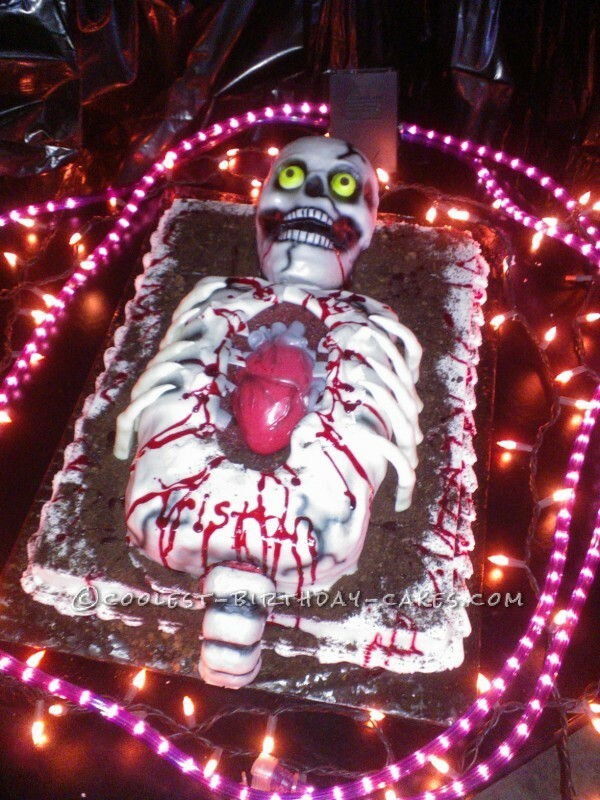 The spine and neck are made of rice crispy treats covered in fondant, the dirt is mashed Oreo cookies and brown sugar and the blood is corn syrup and gel coloring. I then airbrushed additional marks for decoration. The only thing that is not edible is the heart. It took about 18 hours total to assemble him and decorate him, but it was a lot of fun and he loved his cake. Great job Teresa! I am from Neosho MO! And a big thank you for being a EMT. I am sure that it is a hard job. Thank you for helping others! Great job Teresa! I am from Neosho MO! And a big thank you for being a EMT I am sure that is a tha hard job. Thank you for helping others!